Now that the weather is warm and you are finally able to enjoy the outdoors, do your eyes look like this? Are they red, swollen, itchy and watery? Allergy season is back! 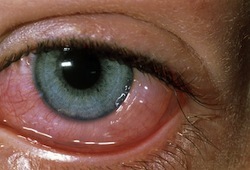 For many patients, over the counter remedies, such as eye drops or allergy medication do the trick. For others, the reaction is more severe. These patients may require prescription anti-allergy drops or even steroid drops. If your eyes are driving you crazy, please come see us. We will get you feeling better in no time!